An early surge powered by two goals from Nicklas Backstrom and a power-play tally from Alex Ovechkin led the Washington Capitals to a Game 1 victory over the Carolina Hurricanes. They'll look to do it again to take a 2-0 series lead Saturday. 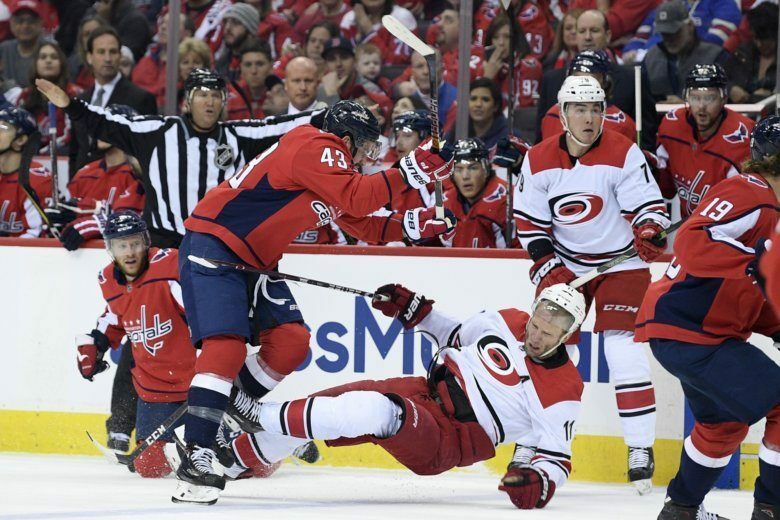 An early surge powered by two goals from Nicklas Backstrom and a power-play tally from Alex Ovechkin led the Washington Capitals to a Game 1 victory Thursday over the Carolina Hurricanes. They’ll look to do it again to take a 2-0 series lead Saturday. Despite a strong first period, the Capitals stepped off the gas a bit in the third, as two goals from Andrei Svechnikov pulled the Hurricanes within one late. Washington will have to show more consistency in Game 2, especially as Carolina continues to prove that they won’t be easy to beat. Here’s how to watch and keep up with the Caps’ action as they head into Game 2 on Saturday, where the puck drops at 3 p.m. on NBC. Location: Capital One Arena, Washington, D.C.
How To Watch: Stream Game 2 of Capitals vs. Hurricanes on the NBC Sports app. Back-to-Backstrom: The Swedish center scored the Caps’ first two goals of their 2019 postseason campaign, and also came up big defensively with big shot blocks. Look for him to continue being an impact player Saturday, especially after finishing the regular season on a hot streak and carrying that over into the playoffs. Power play finally clicking: Although the power play was ailing through the regular season, the Caps managed two power-play goals Thursday, including one from Alex Ovechkin, who also proved difficult to defend. Look for him to be the catalyst and for the power play to keep regaining its rhythm. Opponents to watch: Andrei Svechnikov started the late rally for Carolina, and the 19-year-old has proved dangerous heading into the postseason. He will be a major threat in Game 2 as the Hurricanes look to even things up. Ovechkin has scored in four of his last five playoff games, dating back to the 2018 Stanley Cup Final. Braden Holtby had 27 saves on 29 shots in Game 1 for a .931 save percentage. Lars Eller again sealed the deal with an empty-netter Thursday, scoring the final goal in two straight playoff games dating back to his Cup-clinching goal in Game 5 against the Golden Knights.